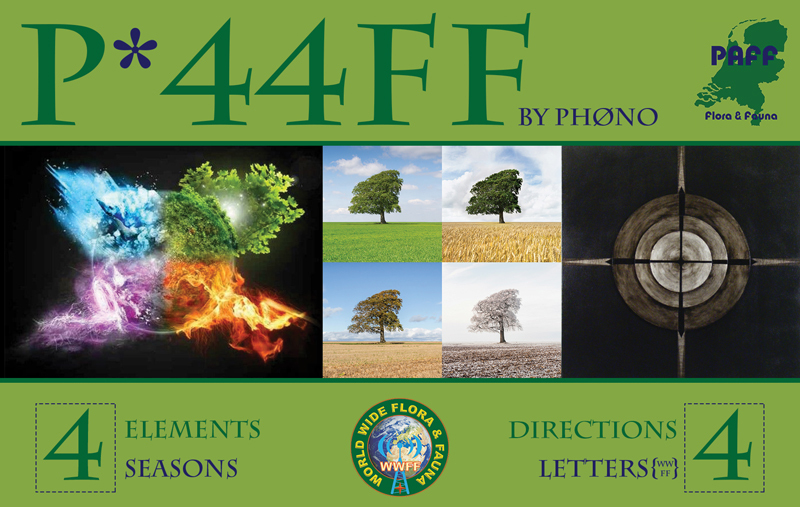 In WWFF the number 44 has a special meaning and is used as exchange at the end of a QSO. There are different stories about what this number actually means but the widely accept version is that the first digit '4' represents the four elements: earth, water, air, and fire and the second digit '4' represents the four directions: north, south, west, and east. When I turned 44 this year I decided to use that as an excuse to put some more time into PAFF activities again and use special calls with 44 in them. The first one will be PA44FF that will go live in December. Special calls are a bit of a nuisance over here as they can only be used for 4 weeks. This means you need to reapply if you want a longer period. However you cannot apply for a new period or new call as long as you hold one. Considering that it takes the authorities 3 weeks to process your request, you can effectively only use a special call every other month.